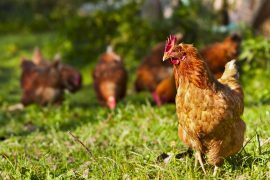 Depending on where people live, their town’s laws regarding poultry, and how much responsibility they can take on, raising chickens can be a very rewarding experience. While caring for and keeping chickens is not too hard of a task, there is always the chance they could develop a health condition you may or may not know how to handle. So, to get a better idea of the type of health concerns chickens and other poultry, such as geese, ducks, and turkeys, can experience, check out a few of the most common concerns below. Chickens are known for sometimes pecking at other chickens’ skin and feathers, an act that is defined as “picking.” It may seem innocent enough, but should a chicken draw blood, this issue could escalate quickly because they are actually attracted to the sight of blood and red in general. Picking could even lead to death if it develops into full blown cannibalism. Common causes for picking include bright lights left on for too long, overcrowding in small spaces, neither enough water or food, or other stresses like territoriality among the birds. The best course of action is to minimize stress, separate any aggressive birds from the rest, remove injured birds and treat their pecking wounds (antibiotics, Manuka honey, wraps, etc. ), and follow expert guidelines for the coop’s lighting. Being able to collect your own eggs is the reason most people raise chickens, but there are occasions when eggs become broken inside the nesting box and the hens taste them. Once hens taste eggs, they eat the broken ones and might even break other eggs and eat them. The only real way to cease egg eating among hens is preventing it, and it must be stopped immediately before it becomes an unbreakable habit. Make sure your chickens have enough space in the coop based on specific dimensions, have about two inches of dry, clean nesting material in the nesting boxes always, and that you collect the eggs early and regularly. If roost mites, tiny parasites, grow unimpeded, they can cause illness or death in chickens, but the state of a chicken’s eggs can luckily indicate if it has mites. Small red spots about as big as a seed tick can identify them, and owners can always check under the roosts for them. As well, another common sign is a hen refusing to lay her eggs in boxes with chicken mites. To treat mite infestations, try using the insecticide permethrin and diatomaceous earth while keeping the coop relatively clean going forward. When deciding to hatch several eggs, hens can become broody, providing warmth by sitting on the eggs, regardless if they’re fertilized. They often do not get up without pecking or hissing if anyone tries lifting them. This can be a good thing for hens who are being raised to reproduce, but for those who just want eggs for eating, broody hens can be a problem. To put an end to the cycle, remove a broody hen from the flock, keeping her separated with water and food and without nesting box access. Owners can also replace her eggs beneath her with a few ice cubes.